(TibetanReview.net, Mar12’16) – China demanded that the event be boycotted, especially targeting diplomats and UN officials, but to its chagrin the Dalai Lama on Mar 11 addressed a packed-house at Geneva’s Graduate Institute as a part of a Nobel Peace laureate panel organized by the United States and Canada on the sidelines of the UN Human rights Council. The day before, on Mar 10, the 57th anniversary of the Tibetan National Uprising Day, the US and 11 other Western countries expressed concerns about human rights in China and Tibet at the Human Rights Council. As the Dalai Lama attended the conference, which was on the theme of Nobel Laureates on Human Rights – A view from civil society, Hundreds of his supporters, some waving Tibetan flags, rallied at the giant three-legged chair landmark outside the UN, reported AP Mar 11. Earlier, in its continuing campaign of intimidation, obstruction and harassment that Western diplomats and activists say is aimed at silencing criticism of its human rights record at the United Nations, China tried to pressure diplomats and UN officials by demanding that they stayed away from the scheduled panel due to the presence of the Dalai Lama. The UN said, however, that it was not bound by instructions from member states. 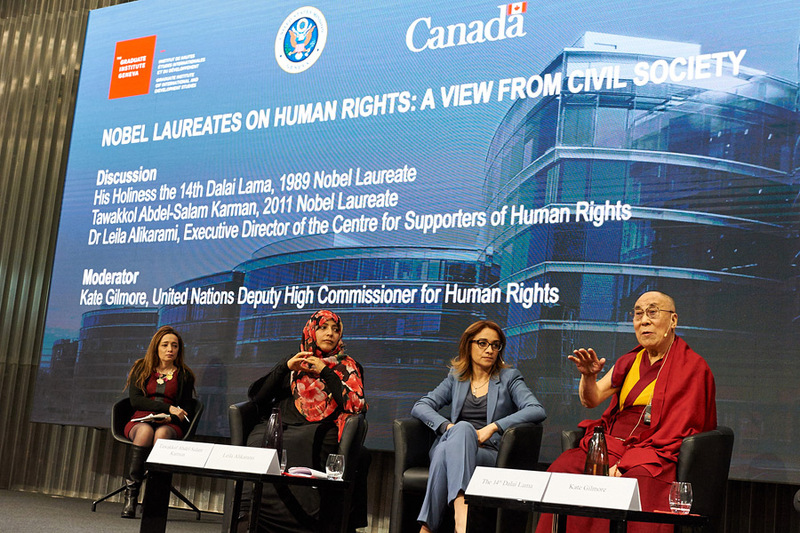 In fact, UN Deputy High Commissioner for Human Rights, Kate Gilmore, the panel’s moderator, was said to be one of the first senior UN officials to meet the Dalai Lama. Writing to diplomats and UN officials, China had indicated that they should boycott the event for its sake, alleging that the 1989 Nobel Peace laureate engaged in “separatist activities”, reported Reuters Mar 11. The Dalai Lama, on the other hand, only seeks meaningful autonomy for his homeland, something on which Beijing does not at all want to hold any dialogue. The panel event was reported to have also featured Nobel laureates from Iran and Yemen.